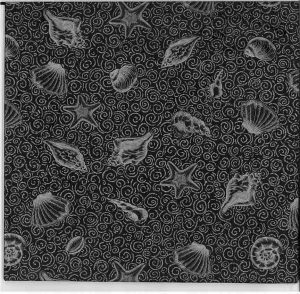 Dramatic Seashells vintage wallpaper border in black and Silver textured pattern of SEASHELLS and STARFISH. This border consists of 5 separate framed panels of assorted seaside elements. There is a silver glaze over the entire surface enhancing the drama of the design. The silver just glitters. There is a narrow band of Silver on the top and bottom edges.